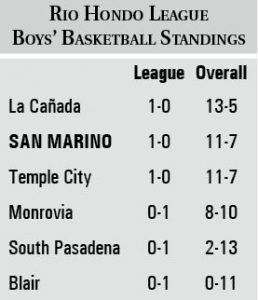 The San Marino High School varsity boys’ basketball team got off to a stellar start in Rio Hondo League play with a dominant 56-40 victory over visiting rival South Pasadena last Saturday. The Titans (11-7 overall record) managed to build a double-digit lead at the half because of its stingy defense. They pressured the Tigers’ shooters and limited them to only two 3-pointers in the first two quarters. South Pasadena (2-13 overall) improved on offense in the second half but was unable to muster a good run to get back in the game. 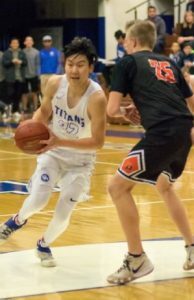 Ethan Deng continues to improve offensively and scored a team-high 16 points against the Tigers last Saturday. 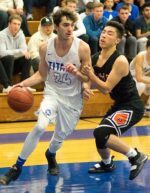 Sean O’Brien netted 12 points and helped the Titans defeat their rival, 56-40, in the teams’ league opener last Saturday. 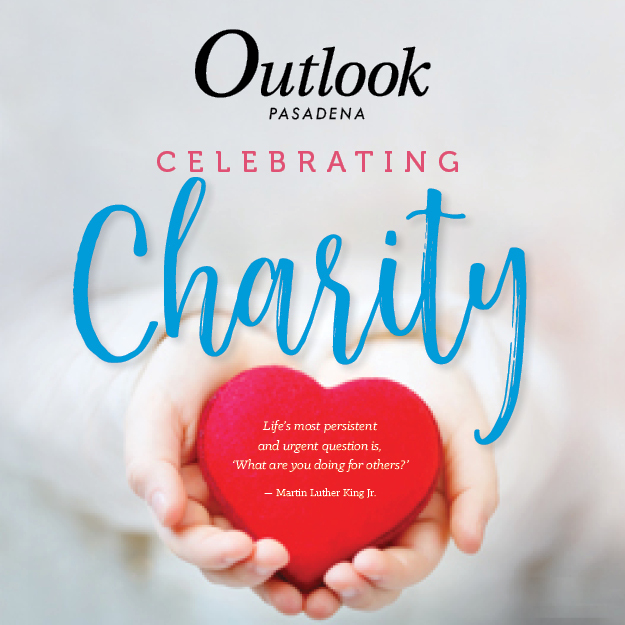 Ethan Deng led San Marino with 16 points and three rebounds and Sean O’Brien chipped in 12 points and five assists. 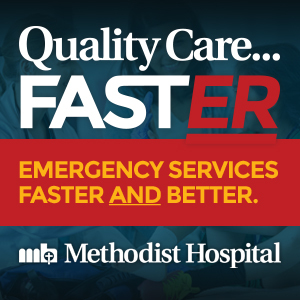 Michael Baldocchi netted six points and grabbed four rebounds, Cristian Mata finished with six points, seven rebounds, two blocks and two steals, Eric Fu had five points, seven rebounds and one block, Ethan Mo scored three points, and Lemuel Li, Chris Wicke and Neven Husson contributed two points each. 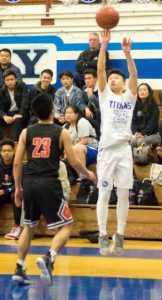 Eric Fu grabbed seven rebounds and scored five points in San Marino’s dominant victory over South Pasadena. Senior Michael Baldocchi turned in another solid performance last Saturday with six points and four rebounds. 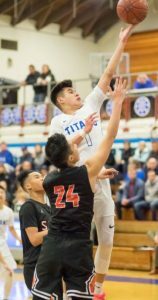 The Titans took on Monrovia on Tuesday and will host Temple City in a league game this Friday, Jan. 11, at 5:15 p.m.